Fear thou not; for I am with thee … ; for I am thy God: I will strengthen thee (Isa. 41:10). “But remember,” my big brother, Herb, said, “this is a church meeting, not a social gathering.” He tried to look stern, but I could tell that he was teasing. He’d said that last bit quietly, almost to himself. I knew life hadn’t been easy for Dad since he’d been baptized. His coworkers teased him about giving up his pipe. And the daily papers often wrote mean things about the Church. But Dad stayed strong. Sometimes I wondered how I would do if I were faced with persecution. I looked up at Herb and wondered what he would do. We soon reached Wolseley Hall. It wasn’t really a proper church building, but that day it looked like one. Members in their best Sunday clothes milled outside the doors, shaking hands and greeting old friends. Then everyone gathered in the hall. When we were seated, some men filed into the seats in the front. I recognized the district president, President Little. He was followed by a man in a long-tailed black coat and a tall silk hat. I tapped my dad’s arm. “Is that Elder Clawson?” I whispered. Dad nodded. 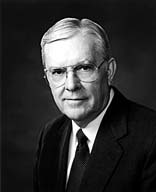 I knew that Elder Rudger Clawson was an Apostle. I looked closely at him, but except for the way he was dressed, he looked the same as the men sitting next to him. But later, when he spoke, I knew that there was something special about him. The feeling in my heart reminded me of our first visit with the missionaries. When they had taught us about Joseph Smith, a warm feeling had filled the room. I felt that same warmth as I listened to Elder Clawson speak. We had three meetings that day, with a break in between each for a bite to eat. I thought I’d be tired of meetings, but I was a little sad when Elder Clawson stood up to give the last talk. I’d felt so good inside all day, I almost wished the day would never end. I tried hard to listen to Elder Clawson’s speech so that I could go home and write it in my journal. But as he was speaking, I heard shouts outside the hall. Suddenly a big splotch of mud hit the window above my head. More mud and rocks struck other windows around the hall, and the shouting grew louder. “What’s happening?” Herb whispered to Dad. “It sounds like a mob,” Dad answered grimly. Elder Clawson finished his talk as if nothing were happening, then announced that he would give the closing prayer. “We ask thee, Father, to watch over and protect us,” he prayed, and as he did, the fear left my heart. After Elder Clawson finished his prayer, he told us to stay in the hall until it was safe to leave. “What are we waiting for?” I whispered to Dad, after we’d been sitting for half an hour, listening to the shouting outside. A few minutes later, a knock sounded boldly on the door. President Little opened the door a crack and peered out. There stood a friend of his, a police officer. He had his uniform on, and he had brought along another police officer. The two officers turned and swung their clubs to make a path for us through the mob. “Stay close,” Dad whispered as we stepped out the door. I took a deep breath and threw my shoulders back, surprised to find that I wasn’t a bit scared. Elder Clawson followed behind us. As he walked through the door, shouts rang out. The crowd surged in around us, and Herb left my side. “Herb,” I called. I turned to see him pluck the hat from Elder Clawson’s head, cram it on his own and dash off. Early the next morning, President Little and Elder Clawson came to our house. Herb, shy for once, placed the hat into Elder Clawson’s hand without a word. “How did you get away?” President Little asked Herb. Elder Clawson smiled. “I do. You were prompted by the Holy Spirit.” He shook Herb’s hand. I smiled proudly at my brother. He had done the right thing. I knew in my heart that I had, too. When we stepped into that mob, I hadn’t bowed my head and tried to hide. I’d held it high to show that I was glad to belong to The Church of Jesus Christ of Latter-day Saints. I promised myself then that I would always hold my head high and never be ashamed of the gospel of Jesus Christ.